Heading into summer, Dunkin' Donuts reveals two new, limited-time cake batter donuts arriving at participating locations nationwide starting Monday, May 28, 2018. 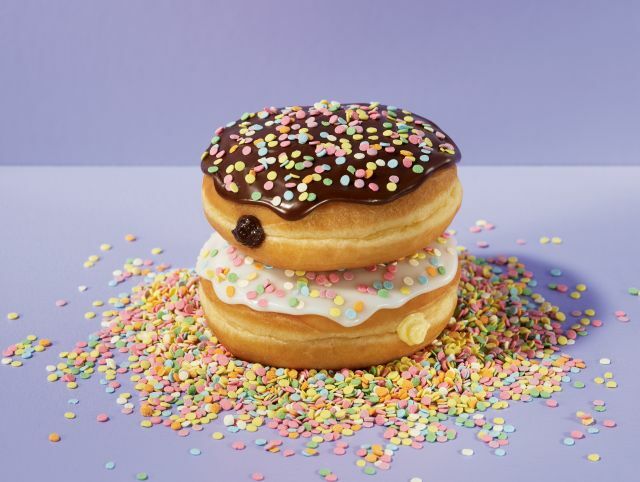 The new Chocolate Cake Batter Donut is a yeast shell donut filled with chocolate buttercreme, frosted with chocolate icing, and finished with confetti sprinkles. The new Vanilla Cake Batter Donut features a yeast shell donut with vanilla-flavored cake batter filling, frosted with white icing, and topped with confetti sprinkles. Select Dunkin' Donuts shops will also carry the seasonal Sweet Summertime Donut, a ring donut sporting a sunshine design made up of blue and yellow icing and a Glazed Old Fashioned Munchkins donut hole in the center. - Party On - Vanilla frosted donut with blue icing and confetti sprinkles. - Strawberry Spectacular - Strawberry frosted donut with confetti sprinkles. - Boston Kreme Bash - A filled donut with Bavarian creme filling, frosted with chocolate icing and a blue icing drizzle. - Chocolate Madness - A chocolate cake donut with chocolate icing and a blue icing drizzle. - Confetti Craze - A chocolate frosted donut with confetti sprinkles.